I’m up in Bellingham at the moment for my work. Lindsey and Avery came along with and are out and about during the day. Avery seems to be having a good time. Mommy took him to the toy store today and found some new toys (I was told there was a shortage of cars to play with). Later this evening we stopped by Mallards Ice Cream for a medicinal cone. 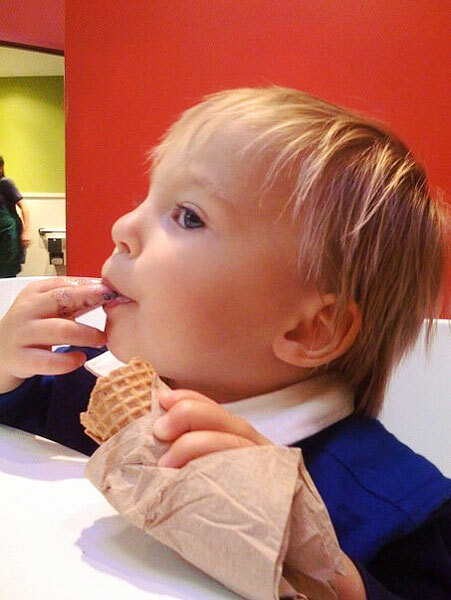 Avery isn’t a big ice cream fan (yet), but tonight towards the end of my cone he reached out for it. Being the obliging parent, I handed it over and he proceeded to take a few bites. He might like ice cream yet!